If you are trying to retrieve some deleted/lost data from your iPhone, you have come to the right place. In this article, we are going to talk about a product that can be your best option to recover lost data from an iPhone, iPad or iPod. 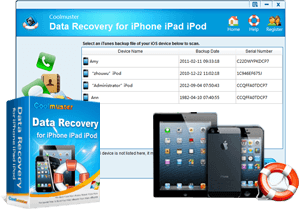 The Coolmuster Data Recovery for iPhone iPad iPod will prove to be a divine intervention for those who have been grappling with the problem of data recovery. One can easily perform iPhone messages recovery or recover deleted contacts on iPhone using this software. Data loss is a problem associated with almost data storage devices across all platforms. Although there are a lot of precautionary steps that one can take to avoid such a situation, none of these can guarantee absolute protection against data loss. So the only real way to be prepared for this situation is by having a proven and reliable data recovery tool that will help you recover the lost data in no time. Can be used with all iPhone, iPad and iPod versions. Recovering lost message from your iPhone is quite easy with this software. The tool will perform a basic search and list all file types that can be recovered. This software allows you to retrieve nine different file types. It will list all files under the selected file type category that can be retrieved. To retrieve messages, you need to select that. All messages can now be recovered by clicking on the ‘recover’ icon. The same procedure can be used to recover deleted contacts on iPhone as well. The only change here would be, instead of choosing messages; you need to select ‘contacts’. You will have the option to either recover all found contacts or only selected ones. All retrieved data needs to be stored to safe locations and regular backup operations performed to ensure that all your vital data will remain safe with you.